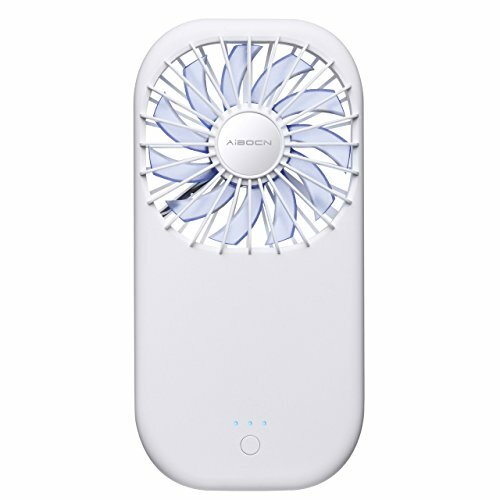 Aibocn Aeolus 2 in 1 Handheld Personal fan, makes you enjoy the summer cool. Freely Choose the wind strength: first press - slight & soft wind, Press again - strong & cool wind, Third press - closed. Three LED on - 100% power, Two LED on: 66%-99% power, One LED on: 26%-65% power, first LED flashing: less 25% power. Lightweight and handy, great travel fans for cooling and fashion in summer. You can charging the fan with computer, car charger, power bank, socket. Replenish energy anytime, anywhere. USB Port (1Amp Output), you can freely charge of your iPhone iPad Samsung Galaxy HTC and more devices at the same time now. Unique and Portable Fan, handheld size with power bank function, take you a pleasantly cool at any time anywhere. Two Settings Free Choose: adjust appropriate mini fan speed by pressing the power button. Special Battery Indicator LED: Three LED on - 100% power, two LED on: 66%-99% power, one LED on: 26%-65% power, first LED flashing: less 25% power. Portable Charger Function: 3500mAh Capacity can charge your phone and enjoy the wind from portable fan simultaneously. If you have any questions about this product by Aibocn, contact us by completing and submitting the form below. If you are looking for a specif part number, please include it with your message.